Despite four consecutive days of 60-degree temperatures on Long Island, one family has managed to keep its snowman around, thanks to a special delivery of fresh powder from the Green Mountain State. Mike Fregoe, 50, and his daughters -- 15-year-old Rebecca and 10-year-old Julia -- built “Snowman” on Jan. 25, and it stuck around throughout the harsh winter weather, growing at one point to 10-feet-4-inches high. But as conditions have warmed up in recent weeks, the Massapequa Park family has had to rely on “snownations” -- that’s the term Fregoe coined for snow donations -- to keep their frigid friend alive. With the help of social media, including a “Save the Snowman” Facebook page that has more than 2,200 followers, the cold stuff has been pouring in from around Long Island and beyond. About a dozen people have donated, Fregoe said, including one little boy who stopped by recently to give away a small container of snow he had been storing in his family's freezer with plans to make a snowball in July. The Fregoe family has also been hauling truckloads of snow from a 4-by-40-foot mound that still remains inside Bethpage State Park. But when they returned from the park last Friday, Fregoe said they found a pleasant surprise waiting outside their home: six containers full of fresh snow that came all the way from Vermont. “It was a beautiful, white, fluffy Vermont snow,” said Fregoe. The snow, which arrived in styrofoam coolers lined with ice packs, was brought to them by a fellow Massapequa Park resident, Carol Giannattasio, who was returning from a ski trip. The new snow allowed the Fregoes to give “Snowman” a makeover, building him back up to 7 feet, but this week’s warmer temperatures once again threatened its existence. “He’s been dripping pretty good,” Fregoe said Wednesday evening, adding that “Snowman” had shrunk back to 5 feet tall. Lately, he says, it takes about a 32-gallon garbage pail full of snow each day to maintain the snowman. When it rains, he covers it with a tarp, and when the sun’s out, he shades it with a large umbrella. “Snowman is hanging in there,” Fregoe wrote in a Facebook update Wednesday in which he posted a photo of the snowman sporting sunglasses and holding a bottle of sunscreen. Fregoe said he’s down to one reserve bin of snow and plans to do another run to the park Thursday, but even that pile of snow has been melting. Tuesday marked “Snowman’s” 80th "birthday," Fregoe said, adding that days count as years when you’re a snowman. “I’d love to make it to three months,” he said, but admitted at this point, he’s just focused on keeping the snowman around through the rest of the week. 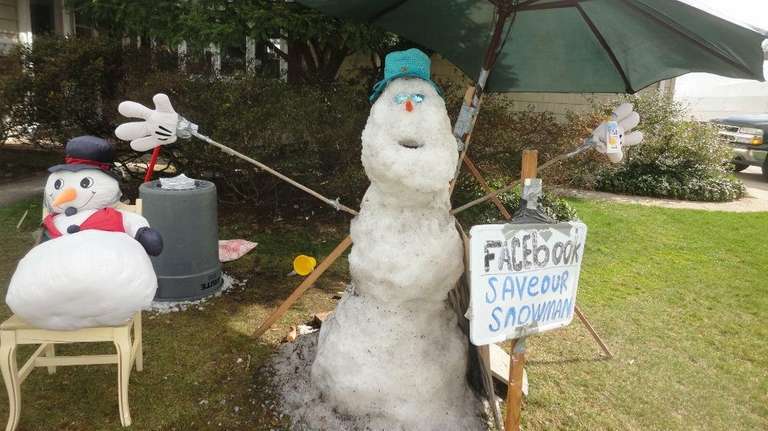 Fregoe said when he started the Facebook campaign in early March, he never expected the outpouring of support his family received or that weeks later he’d still be tending to the snowman. But although it’s become quite a project, he said it’s worth it. And when it does eventually come time to say goodbye to their cold creation, Fregoe said he promised his daughters he would take a small piece of “Snowman,” about the size of a snowball, and store it in the freezer.